After 10+ years of only road racing, I had converted to mostly trail running and was looking for a race to help me transition from road racing to trail racing. I wanted a local race so I could practice on parts of the course and a scenic course so that if all failed and I ran horribly, at least it would be pretty. 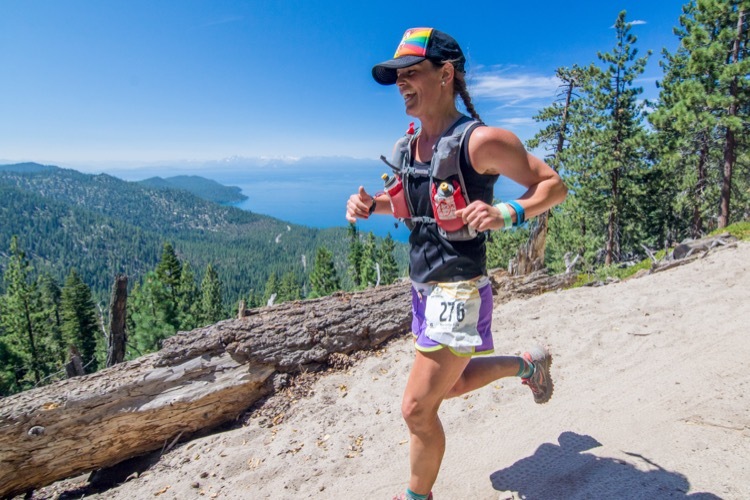 The Marlette Lake 50K fit my criteria perfectly. On race morning, the scene was calm, much calmer than any road race I have participated in. Luckily the heat wave had ended and it actually felt cold compared to the extremely hot month of July we had just endured. I was super nervous, but the vibe was happy and everyone was really encouraging and friendly. Also, being able to use real bathrooms was a plus compared to the standard pre-race port-a-potty. We all meandered down to the lake for the pre-race meeting where the start procedure, aid station supplies, and course were discussed and everything started on time. And just like that, we were off. Despite my 25 road marathon completions, I was not too sure how fast to start, so I just got in a pack and went their pace. Within a mile we started climbing up the Tahoe Rim Trail to Snow Valley Peak, a segment I had practiced multiple times. My first time practicing the Snow Valley Peak climb during my training, I attempted to run the entire way and when I got to the top I was dizzy and could barely muster a run on the downhill, and essentially walked the entire way back to my car. After speaking with some veteran trail runners, although frustrated and defeated, I went right back to Spooner Lake and gave the climb another try, this time with a strong emphasis on a fast hike. I made it up to the top only a few minutes slower than the first time and was able to run down at a surprisingly speedy pace. I repeated this training one more time prior to the race. So there we were, trudging up to Snow Valley Peak and I am keeping my fast hike game on, knowing that near the top the sweet view would make it all worth it. I got to the spot where you can see Lake Tahoe and I knew I was close. I made it to the aid station at the top and felt great. I filled up water, fueled up, admired some views, and took off downhill. I made it to the next aid station, which was right where I expected it (per my nerdy aid station mileage bracelet I made in preparation), as were all the aid stations, a key aspect to fueling properly for me during this race. I filled up, grabbed a fig bar and some sour patch kids and headed up the single track. This part of the course was new to me, but it was easy to stay on course despite being alone for a handful of miles. At one point, I thought I was coming up on another runner, but it ended up being a bear (my first bear sighting!). He was pretty easy going and moseyed across the trail, so I was able to keep on trucking up the climb after a brief stop; I assumed he was hanging out there to cheer me on. I had imagined the view at the top of this climb coming out of Hobart Reservoir would be good, but that was an outrageous understatement. Once you finish this uphill segment around mile 16, which is the last giant climb, you come to this overlook of Lake Tahoe and Marlette Lake that takes your breath away. I opened my arms into the breeze and ran across the ridge feeling an epic moment of bliss. The next section of the course was a variety of ups and downs and changing terrain, which made it go by quickly. It was also mostly in the trees, which was nice as the weather had started heating up quite a bit. Soon enough, the course winds up on the Marlette Lake flume trail, a trail everyone should spend some time on for its pure beauty. I had figured the race would be smooth sailing after that point since the big climbs were done, but I underestimated that the flat-ish/kind-of-uphill 5 mile sandy section on the flume trail. It took some concerted effort to keep up the pace. The fact that you are staring at Lake Tahoe certainly takes the 20-miles-into-the-race pain away, and the mountain bikers on the course cheered and were quite motivating, which was an added plus. Once you hit mile 26, it is actually all downhill with short flat sections for the remainder of the race, which was great for me at that point. I was still feeling good, but I was getting tired and my quads were starting to feel it. I was way ahead of my “finish in 6 hours” goal, so at this point I just wanted to catch people, which I was able to do a few more times, keeping my motivation going. Approaching the finish was a pretty amazing experience for me. The course finishes right at Spooner Lake, which is beautiful. There was music, food, beer, and high fives from strangers. My race went way better than I imagined. I will be back again next year. The 2018 Marlette 50K takes place on Saturday, August 11, 2018.